Another massive fire in Mbeubeuss landfill in Dakar, show support! 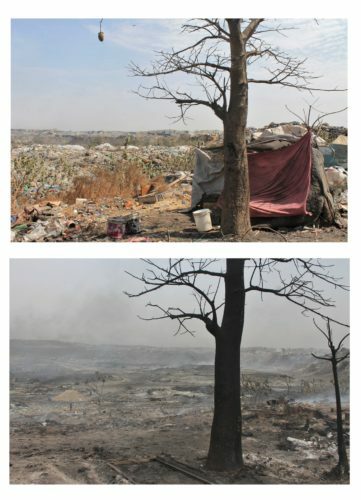 Before and after the fire in Mbeubeuss landfill. On Sunday the 11th of February 2018 a massive fire broke out at the Mbeubeuss waste dump in Dakar, Senegal. According to recent estimates, there are 2,500 waste pickers who earn their living recuperating recyclable materials from the dump. Some of these waste pickers lost years of storage, raw material, and shelter in the fire. In addition to the individual waste pickers who work on the dump, a plastic recycling company had been established there by Mr. Abdoul Aziz. Mr. Aziz is a founding member of the Mbeubeuss waste picker’s association Bokk Diom, and a former waste picker himself, who has worked at the dump since the 1970’s. His business involved the collection, cleaning and selling of plastic materials recovered from the dump. The business employed 75 men and women waste pickers and was completely destroyed in the fire. This is not the first time Mbeubeuss has caught fire. A previous fire in 2016, in a different area of the dump, also destroyed waste pickers’ stock, and devastatingly also resulted in a loss of life. The waste pickers of Mbeubeuss want safer, more dignified working conditions and recognition as legitimate workers who are providing an environmental service. In the wake of this most recent fire, plans are taking shape among members of Bokk Diom to mobilize around a platform of demands for on-site improvements at Mbeubeuss. Mbeubeuss. Show your support here. Smoke from the fire in Mbebeuss landfill. Photos and videos by Jenna Harvey and Grabriella Tanvé. Global Capitalism Is the New Colonialism for Workers, and They Are Resisting Whether it”s fast-food workers in Tampa, garment workers in Cambodia, berry pickers in Baja California or small rice farmers in the Philippine Cordillera, people I interviewed for this book displayed sophisticated understandings about the flood of transnational capital that has washed over our planet in the last 40 years; World Trade Organization regulations that eviscerate national labor, environmental and land rights; and the willingness of local elites and politicians to employ violence in support of neoliberalism. And they understand that these are problems that poor people face worldwide. Filipino labor organizer Josua Mata argues that global capitalism is the new colonialism. He recalls a moment in the early 1990s when that dawned on Philippine activists. “We were just starting to grasp what was happening, he says, “that global organizing was essential. In that moment, he says, it became clear that, to stay vital and relevant, the labor movement had to begin to think and organize as capitalists were already doing – globally. And they have.